That’s right! The Patch King is now hard at work creating an amazing new library for ALL of Arturia’s V Collection. The Minimoog V is the first release from the new collection and is now available. Several other libraries will follow throughout the year including new sounds for the Arturia Moog Modular V, ARP2600 V, CS-80V, Prophet-V and Jupiter-8V. 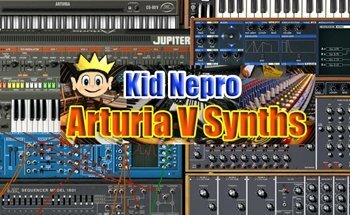 The Kid Nepro Arturia Minimoog V Collection contains A cool mix of 100 new virtual analog patches ranging from phat basses to screaming leads, smooth pads, funky effects and a lot more. For us, programming a Minimoog is like riding a bicycle – you never forget how to do it! The collection of new sounds is done with expert care from someone who knows the classic synth very well – so you can be sure that the patches are all well crafted and sound great. Sign our guest list and we will contact you as soon as our other Arturia V sounds are available. Please contact us if you need any more info.